During the school year, tens of thousands of Oregon children eat free or reduced price school meals each day. However, when school ends for the year, so does this important resource. The Summer Food Service Program (provided by the US Department of Agriculture) is meant to help fill that nutritional gap. Summer meal sites are community programs and all children are welcome, no proof of income is required. 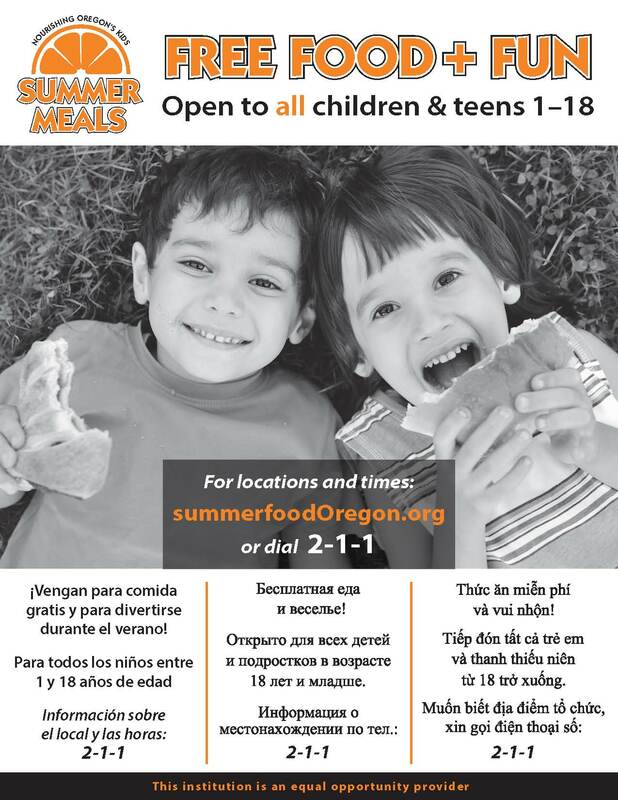 Summer Meals is open to all kids 1-18. Adults are welcome to attend, although the meal service is just for kids. Some sites offer fun, supervised enrichment activities for kids. Activities: There are supervised group games and activities for registered Club Members only. Use the map to locate additional locations in Lane County. All sites are closed on the 4th of July. The success of child nutrition programs often depends on the support and engagement of the community. Contact the site to volunteer. Your help may be needed to pass out meals, lead games or distribute flyers around town. Help spread the word. Many families have never heard of the Summer Food Service Program, or have misperceptions about who is able to use it. Last year, only 1 in 5 kids who ate a free or reduced price school lunch also ate at a summer meal site in Oregon. Please help us let parents and kids know about this important resource. June 21, 2016 in community, hunger.